Lot of virtual sailing the next couple of weeks, 5.600 nm to Seattle, approx. three weeks of sailing. Hopefully we will get some interesting routing alternatives! There may be two options around Japan. But it depends on the weather. thanks for your great job for all VR gamers. 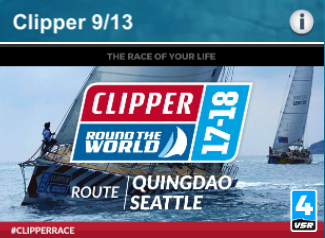 I would like to know when the CLIPPER RTW 09 route will be online on zezo ? The problem: The start city is always Sanya. Thanks. There was one process left on the server with the old defaults. Clearing the cookies should fix the starting position. I confirm, after cleaning my cookies, the road is OK now. Thanks to you. With the current weather the possible choice seems to be "which side of Hokkaido", with the deciding moment 4-5 days in the race. And then even a very Southern route is goint to Jeju island initially (wit an anticyclone centered W of it and blocking the road). The Great Circle route far North will probably end up on the wrong side of the low pressure system(s), but there are cases when it could actually work. With C0 & foils checked on the router, toggling the winches option shows a surprisingly large difference - 25 hours over 16 days. Indicative of extensive sail changes ahead? I believe that's what happened in the last edition of the Clipper. I seem to recall short-tacking up one of those coasts until 2 or 3 AM my time, with all of the positions from roughly 10th to 80th on the line. I remember also putting some serious thought into the viability of routes leaving Vancouver Island to starboard, but needing to conclude that none would work. No matter how little wind there is in that straight, there always seems to be less on Vancouver Island's NE coast. Right now zezo often changes the route between north and south of Hikkaido when I change the zoom level even if I change zoom with just seconds in between. How come zezo does like this? Does zezo use different algorithms for different zoom levels? Zoom level can't really affect the route because different levels use the same data, but it's possible to get one zoom level cached for few (up to 10) minutes and showing the old results during a weather update. That's if you just browse old chart. Every position update creates new track and defeats the caching. But now that 15 minutes have passed, zezo recommends the south route every time. Because we have the full model output now. The 16-day forecast is not very useful by itself. In fact the low pressure systems are almost guaranteed _not_ to be where they are predicted now. It's more about watching the trends. The South route is better more of the time, the North is a big gamble. You may place a bet on it, but it's got just a 10-20% chance. seems like the majority is going north, but the race leaders go south. There is a wind hole forming N of Hokkaido. It will delay the progress by almost a day and that shifted the route back South. Also a ridge around the Kuril islands. I went North, and will sail under Sachalin. It would be nice to meet You somewhere - what is a name of Your boat? Ha! I thought I had it set. Checked the routing on Zezo (awesome) and logic checked it against the #1 placed boat in the fleet, but zoomed out and saw all these other people escaping out down the bottom! Fingers crossed! Anyone knows the boat name #1 in the North? Nice to keep track of him/her. I noted roughly 20 more when they were at the top of the leaderboard... Aigle, Bohemien, Slystar, Koenigswelle, tesan, ClaudiusAbers, and more. Plenty of good boats up there. at the moment is 2 days advantage for the south group towards Seattle. Ursus Maritimus is als north, but not in the top. Yeah, me too. The wind direction and strength are different. Zezo says the the wind is 231 degrees at 8.4 kts. But VR says the wind is 256 degrees at 9.5kts. Please check your longitude East vs West. It's possible to see such difference around the center of a system, especially during the forecast update cycle. Keep in mind that in such conditions the game client may also show different wind than the one used by the server to move your boat. Not for me. When it is the case, give your position so that we can have a look. Regarding the list of boats that went North early... I just checked on all 30+ boats that I noted when that group was on top of the leaderboard several days ago. Most of them followed paths similar to Luxairfrance, dropping in now significantly behind the leaders of the South group. They're spread out to the North and South of Luxair, but are all in the same general wind system with the same remaining options. So if you want to know where those boats are, "near Luxair" is probably a good enough answer unless Luxair takes a flyer between now and the finish. A few that I noted on the extreme North end of the "near Luxair" pack were Gabriel2712, K1-AO-CPMG, Slystar, and Nanoche. They're likely to eventually merge with the others, but from that position, it's possible one or more of them might take a flyer further North. The only boats I would say are doing something entirely different from the rest are Vicvol and La Route Logique. Both have pushed quite far North. Their fate probably isn't likely to be better than the Luxair group, but if you want to keep an eye on the boats who went furthest North, those are the two I know about. If anyone knows of a boat North of the Aleutians ahead of the boats I've identified, please feel free to identify them. They're not in the position you described, north of the Aleutians, but what do you think about the position of current ranking leader brigitte980 (probably the boat that has progressed farthest to the East) and Nicky761 a little southwest of brigitte980? I think Zottl's analysis covers it well, except that there are boats ahead of me by more than an hour in my area. Djonny, Raketa, Awkward Turtle, etc. I think I've gained on them lately, so it might not still be an hour, but it was more than an hour the last time we crossed while I was awake. I wouldn't be surprised if there are 100+ boats ahead of me in the south. I'm hoping I'm wrong about that, but with the ranking system as it is, I have no way to know until we move up the leaderboard. So... Per Zottl's analysis with the above comments... The boats at the front of the South group have probably 6-7 hours on the current leaders, based on the current forecast... but those leaders have leverage such that if the forecast changes, we could suddenly see the complete opposite. That north group still has a chance, but they need the forecast to change. That's similar to why I was looking at Vicvol and La Route Logique and asking if anyone knows of anyone ahead of them up there. Zottl is correct that with the current forecast, they're completely screwed. But they have enough leverage that if some kind of huge change occurs in the forecast, they could suddenly look much better. On the other hand, the larger fraction of the original North group that has decided to cut their losses and head south has eliminated their leverage. They're stuck behind the current leaders no matter what happens to the forecast. They have a chance to pick up some of the South group with a forecast change, and some of them are good enough to simply catch the back of the original South group, butthey won't be catching boats like brigitte and Nicky without some kind of freak lucky flyer. Again a plea to add DTFc and maybe CMGc to VR-dashboard. On the last ocean of every race or leg, we will have for free the exact distance to finish. The ranking by VR is rubbish and unreliable with all the invisible gates. I decided to cut my losses three days ago and followed zezo leading me southbound. Lost places downto 2800th and now recovering gradually at 1300th. Maybe I'm lucky because far away from most in front of me. If I went north around island at the start does that mean it hasn’t registered me going through that gate? I would sail on, Select some boats around you now, add them to the boats you follow, and race them to the finish. That would be much more fun than going all the way back to the island and racing by yourself. And if you went back, the race will almost certainly close before you could complete the course, so either way you will classify as finishing last. There are sometime buoys with rotating arrows indicating the way to round it. Once rounded they will become green. Probably the arrows on the island are still white and rotating. Good luck next time and use this race to learn how to optimise your race. Are you using the zezo extensions for Chrome(VR Dashboard and Route zezo.org)? Only came across this site randomly then noticed some of the players names in here I follow. I’m using more mobile phone but will look into the chrome extensions at work today. Just checking. For the last 30 min I can not connect to game server on Clipper, not on PC, not on mobile. Does it work for you?